Come out and join us on a group ride! We have three basic rules that all riders must comply with for the safety of everyone. Ride leaders have authority to enforce rules if needed. Supportive – we’re here to have fun, look out for one another, slow down to support the group, watch for stragglers. Don’t be shy- ask questions, speak up! PLEASE NOTE: All participants in NCC groups rides are required to sign a waiver. If you are a current member, you did this when you renewed/signed up. If you can’t remember, ask the ride leader for a waiver form and sign it! MONDAY — We feature a “Delta” ride on Monday. Delta Ride (Meet: Sheldon Field, Northampton Start: 5:30 PM). No-drop; 12-14 mph, 15-20 miles, touring, commuter, road, bikes are all welcome. The rides will be posted to our event calendar – please check for any changes week to week on time or location changes. TUESDAY — We feature “C” paced group ride and an informal race series on Tuesday (two different events!). C-Ride (Meet:Pulaski Park, Northampton Start: 5:30 PM) Riders should be able to average 15-18 mph over 20-30+ miles, depending on the terrain. The route changes each week and riders should be self sufficient with lights and flat kits. The C-Ride is a no drop ride, within reason. Grab your road bikes and join us! Time Trials and Hill Climbs (All Tuesday night races start at 6 PM; start locations vary — check the calendar for locations each week) TT/HC series details, overview, and points/time tracking available on the Tuesday Night Series events page; see also TT/HC series route descriptions and maps. WEDNESDAY — We feature an A/B level group ride on Wednesday. A and B Ride (Meet:Pulaski Park, Northampton Start: 5:30 PM – always check calendar for start times) Description: We will ride up Route 9 and over to the center of Hatfield via River Rd as a combined group at a CONVERSATIONAL PACE (15-18 MPH) then stop and let the A group go. The route continues on River Road into Sunderland and then to the Montague Book Mill and back following the Connecticut River. We return on Route 47 for a rousing finish. The Book Mill run goes a little over 37 miles with a single hill in the middle (see the Ride Routes post for a detailed map of the route). The B ride usually finishes about 18-20 mph. The A ride goes much faster, but enjoys the scenery less. All riders must be self-sufficient as they may get dropped. The Route 47 portion of the ride tends to speed up. NEW FOR 2018: THERE IS NO SPRINT RACE AT THE END (Cemetery Rd) for safety reasons. All riders are expected to be respectful to others, follow the rules of the road, and most of all, have fun. Hilltown route (Meet:Pulaski Park, Northampton Start: 5:30 PM) Description: This is a hilly 36 mile route that rolls through Florence, Leeds and Williamsburg before heading sharply uphill to Route 116 and then downhill to Conway (see the Ride Routes post for a detailed map of the route). This ride usually consists of A and B level riders. It is typically a combined A/B ride with a REASONABLE, and ideally, CONVERSATIONAL pace (16-19 MPH) up until the center of Williamsburg, where we will stop and determine if we want to break up the group. We aim to maintain a conversational pace for the first eight miles into Williamsburg as stated above. The pace picks up on the climb out of Williamsburg, with a regroup point at Route 116 and another regroup after the Whately Road climb. This is a drop ride, meaning you should be prepared to be self-sufficient if you can’t keep up, but we generally try to wait long enough at the regroup points to try to get everyone back together. Saturday B Ride (Meet:Pulaski Park, Northampton Start: 9 AM — check calendar page for start times, sometimes we adjust due to weather). This is a longer distance B-paced ride. We can ride anywhere from forty to eighty miles with plenty of opportunities to cut the ride short or go longer. Expect a conversational pace for about five miles as we roll out of town at the beginning of the ride – it’s Saturday after all. A and strong C-paced riders are welcome, but will respectively either need to be patient or be prepared to ride solo if too large of a gap opens up. So long as riders are generally matched we aim to work together and wait on selected hills to regroup. Speaking of hills, plan to do some climbing on this ride as we often patch together a series of climbs that can total anywhere from two to six-thousand feet of climbing. 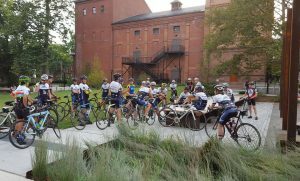 Saturday C Ride (Meet:Pulaski Park, Northampton Start: 10 AM in the spring/fall, 9 AM in the summer — check calendar page for start times). This is a shorter distance C-paced ride. We can ride anywhere from 30 to 60 miles with plenty of opportunities to cut the ride short or go longer at at least one rest stop. Expect a conversational and supportive pace the entire ride. This ride is NO DROP, (within reason) but please arrive prepared with at least supplies to fix a flat and a cell phone. If you show up at one of the rides above, other cyclists should be there. If the weather is questionable, check the ride listing on the calendar page — ride leaders will post announcements there. Check the Recommendations for Ride Organization and Safety. Always follow the rules of the road, i.e., stop at stop signs, red lights, give pedestrians in walkways the right-of-way, etc. Ride single file out of town. Large groups will be divided into smaller groups of riders by athletic level ( i.e. A, B, C) at the discretion of the ride leader(s). When a pace line is doubled up, a rotation should be used so that riders are never 4 abreast. An explanation/re-cap of this rotation is encouraged before each ride to those unfamiliar with it. WARNING from Our Surgeon General: Attending these rides regularly will get your body in great shape all while having a wonderful time. Be prepared for a major life change.